Bumping miners is at the very core of what the New Order does, but it's not the only thing we do. Embracing the diversity of EVE gameplay is important to us; as we recently discussed, there are many ways to enforce the Code. I encountered highsec miner Hail Heaven while touring one of my ice fields. He gave me the same old excuses about violating the Code. "Extortion" is among the most popular squares on Miner Bingo, and one of the most tiresome. Hail wasn't exactly going for originality, I could tell. Like many ignorant miners, he accused anyone and everyone of being my alt. Beneath the surface, however, I could tell this man was consumed by dark thoughts. A nerf to bumping? Hail's comments were right in line with what you would expect from a disobedient miner. I wanted desperately to find a way to reach him, to wake him up from his AFK mining-induced slumber. Fate intervened. I was contacted by Hesperaa, a hero of the New Order well known to regular readers of this blog. 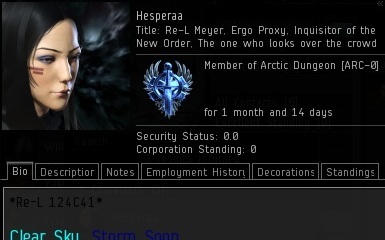 Hesperaa is the CEO of Arctic Dungeon, a loyalist corporation that specializes in the use of wardecs. Among Arctic Dungeon's victories are the infamous Bhaalgorn kill and the defeat of hostile corporations. A warrior of peace, Hesperaa has helped convince our enemies to switch sides and join the New Order. 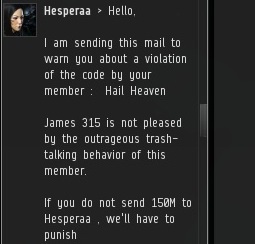 While speaking with Hesperaa, I shared the details of Hail Heaven's violations of the Code. Hesperaa decided to declare war against Hail's corporation. 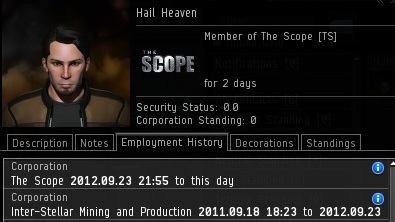 Hail belonged to Inter-Stellar Mining and Production, a highsec corp with about 27 members. 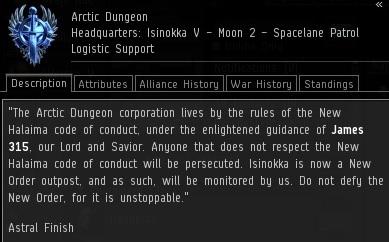 Hesperaa began drafting an EVEmail to the corp's CEO so they would understand the reason for the war. We wanted the corp to be aware they had a Code violator in their midst, and that this was not some random act of violence. Not long afterward, I received an EVEmail from Hesperaa about the progress of the war. Arctic Dungeon was already victorious. He was expelled from his corp, which he had belonged to for just over a year. Inter-Stellar Mining and Production was not interested in harboring a criminal. Making the necessary payment to end the war and join the New Order was a much more attractive option. Hail Heaven did not respond to my request for comment, but I'm sure if he did, he would confess that his punishment was deserved. 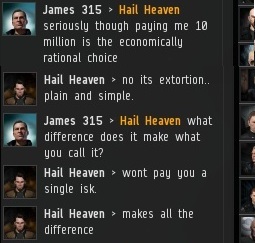 Let Hail's story serve as a cautionary tale for all who would oppose the rightful law of highsec! A very good idea. Bumping does not require too much in the way of isk or skillpoints. All you really need is heart. And honor, James. Don't forget the honor. And as so many people learn, it's far better to end up in a screenshot on this blog as a supporter of the New Order than as one of its enemies. This is a genius blog and I fully support everything you stand for. Sorry, Hail Heaven, but I couldn't help but laugh at your punishment for rebelling against the New Order. It's nice to see that your old last corp at least has the dignity not to house terrorists. This website is full of such arrogant simpletons and people who call themselves good although they are in fact just pirates.